I was very pleased with my root canal procedure. Everyone in the office was very nice. When I first went to Dr Forbes for corrective work on two front root canals, I was very stressed about the numbing process. Surprisingly, he jiggles my upper lip and injected both areas and I felt nothing. He corrected what needed to be done. Yea, there was a lot of pressure but really no pain. I iced the swelling and all is well after one week. His staff was wonderful and very caring. Thank you, Dr Forbes and staff. Considering the circumstances,an over-all outstanding (beyond Excellent) experience. were wonderful! I rate this office and Dr. Forbs 15 on a scale of 10. Thank you! and has a good sense of humor as well. And, did I mention that his staff is great too. when he gave me the shot. I would come back again and again. definitely use this doctor again. needed no pain medication before my permanent fillings were put in. Thank you for a super job on my two Root Canals. Dr. Forbes and his staff are truly exceptional. Every part of my visit was congenial, professional, and they made this experience outstanding. For my 1 st experience of a Root Canal I could almost say it was a pleasure. From the pleasant hassle free chat with Cindy to making the appointment, through the near painless procedure with the very competent staff. I was very surprised that a dreaded Root Canal was not so bad. Dr. Forbes was remarkable throughout, with a positive follow up. Thanks! cavity. I decided to take this opinion. It was a lengthy procedure but completely painless. Dr.
Root Canal treatment with Dr. Forbes. Many thanks to him and to all his friendly staff. 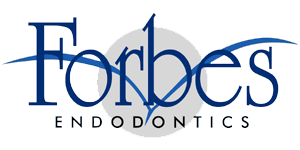 "My first experience with Forbes Endodontics was nothing short of great! I went in for a root canal and the staff was super accommodating, making me feel comfortable straight away. They asked how I was doing and offered me water. The procedure itself went smoothly, and once the numbness wore off it didn%u2019t hurt at all! No pain medication needed here! Thank you Forbes Endodontics team!" "Dr. Forbes is absolutely Amazing!!! I had a surgery procedure. I felt no pain with the injection, during the surgery and after surgery. Dr. Forbes has a kind heart filled with compassion for his patients. He and his staff treat you like family. I am so grateful to have him as my Endodontist. No worries here! He is the BEST! Thank you Dr. Forbes and Staff!" It was a wonderful experience. The attitude of everyone was "super". I was Referred by Dr Miller. No problems, no fuss, no bothers…Just expertise and the highest professionalism. Root Canals are mean strangers. Mine was put away quick and painlessly with no discomfort. I recommend Dr Forbes and his super impressive staff always and any time. Great news for all of us searching for an excellent Endodontist. Don't put it off any longer. It may only get worse. I was very fortunate in my search when I found Forbes Endodontics in New Port Richey. I've had multiple procedures performed by Dr. Forbes and I'm very impressed and feel very fortunate that I decided to go there. You will be astonished as I was at the excellent work performed with no pain or discomfort. I no longer associate Endodontics e.g., Root Canal etc. with pain and discomfort. Dr. Forbes and his caring staff are an outstanding group ready to serve your needs. Facility is clean and modern with all the proper equipment. My root canal repair wasn't fun but at least I felt secure that all the staff knows what the are doing. The results were very good. Translation: “My experience at Forbes Endodontics: I am very grateful for the attention I received as soon as I entered the office. There was a welcoming atmosphere, the receptionists attend you kindly, and the doctor explains in detail the procedure that will apply to your tooth. My assistant, was bilingual, she gave me confidence and was very friendly. I am satisfied with the work they did to me. longer will be nervous if I should ever need another on- PIECE OF CAKE. and personality, I was relieved and had no fear at all! He provided painless dentistry. Madi & Aralis, his assistants were awesome! Great Job! Swift, Painless, No after problems. Many Thanks! I was very happy with the work done on my root canal. I had no problems afterwards and the staff was very helpful. I was happy with everyone that helped complete the procedure. Everything was successful! "I was very comfortable with my whole experience. I would definitely recommend this office, from the front desk to Dr. Forbes and his assistants." I'm so pleased that I went to Forbes Endodontics to have my root canal done..Dr.Forbes and his assistant did a great job, and his front end ladies are the best!!! "I though that a Root Canal was worse than swallowing glass! Not Bad at all. Staff was wonderful, Dr Forbes couldn't have been more empathetic. Brett is a great assistant." Appointments were timely! Payments were painless! Thank You! "Dr Forbes is an excellent surgeon and explains everything in detail. The staff is very friendly and are willing to help as much as possible." "Very Satisfied with my visit- NO PAIN!!" "Thank you Dr Forbes and his entire staff for the care given during my recent Root Canal procedure. I was treated with the utmost consideration and kindness, putting me at complete ease from the first consultation appointment to my final appointment." "I want to thank Dr Forbes and Personnel for being nice and concerned about me when I was terrified of having the my first Root Canal. Thank god is was amazing and painless, the surgery took less time that I expected. Next time I would be less scared." Thank you again Dr Forbes! "Excellent Service, Very Professional, Friendly staff."